Aristotle is right: who would want to live a life without friends? We especially realize that when a friend moves away and most vividly when a friend dies. In January of 2017, my friend David McKnight passed away. A man who already had endured many steep challenges in his life, he had been diagnosed in November with a massive and inoperable brain tumor. When the news came about the brain tumor, it seemed to foretell the sad end of a tragic life. Was it? Let me tell the story of David and of some of his friendships, and you be the judge. 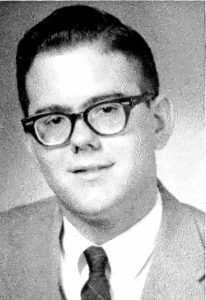 David wrote the sports column in our Garinger High School paper, was voted in 1966 the senior guy “Most Likely to Succeed,” and was a finalist for the highly esteemed Morehead Scholarship to UNC – Chapel Hill. Perhaps my earliest memory of him is from Miss Mary Balle’s English class, where we read Chaucer, Shakespeare and all the greatest hits of Brit Lit. David was always full of energy, unable to repress his bad puns which we all secretly loved. Once he somehow turned a class discussion to a question of responsibility about actions just so he could say, “It’s neither my Faulk-ner yours that It happened.” All of us, including Miss Balle, groaned, and then we all laughed. The memory makes me smile. He and I played tennis matches near his house, at Midwood Park. The tennis was fun, but David’s running commentary before, during, and after the match turned the game into struggles both hilarious and grand beyond words: Beowulf vs. Grindel, Rod Laver vs. Ken Rosewall, madness vs. King Lear. The Guy Most Likely to Succeed was accepted at prestigious Duke University. There he could continue his virtuoso violin, his study of multiple languages, history, journalism and whatever else struck his fancy. It looked like a cloudless blue sky. Then there were surprises I never saw coming. David became the guy wearing the Duke Blue Devil costume at basketball games. Still full of hilarious and grand stories. Like the exam he refused to take because of a difference of opinion with the professor, thus an F. More F’s. Ultimately an unfinished college career in which every course earned either an A or an F, according to David. 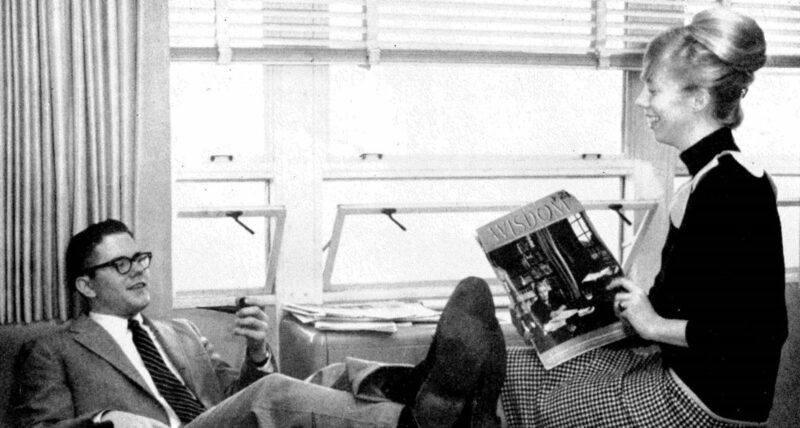 He did not want a high-brow college education, he wanted a life of the rough and tumble of journalism. After leaving Duke, he told me one day in 1968 that he had decided to fly to Czechoslovakia to report on the Prague Spring liberalizations in that Communist country. Given the threat of an invasion by the Soviet Union, the decision seemed both sudden and perilous. The next day I put him on a plane to Prague. He carried his manual typewriter in its case, and a gym bag containing a change of underwear and one clean shirt – that was it. It was crazy. And, I thought, heroic. He published some fine stories on that trip, came back and got jobs with newspapers in Durham, Greensboro, and then in Fayetteville, where another of our close high-school friends lived. When my wife and I visited there, David and I played tennis in the hot summer morning sun. We all drank Tequila Sunrises afterwards. It was grand. That night we all rode around the town, David with his beautiful and accomplished fiancée. We passed by a Fayetteville structure resembling the Eiffel Tower, and David cracked us up with, “When I saw the tower, I-fallaciously thought we were in Paris.” We were young, life was good. Philosophy begins with questions and problems that arise from our experience. As I look back on these early years of my friendship with David, as I wonder about what friendship really is and whether I really was David’s friend, my questions transport me from memory, narrative and emotion to more analytical thoughts about our relationship. Aristotle’s observations and thoughts about friendship, written over 2,300 years ago, are still helpful today. Aristotle writes that friendship is love for each other, “reciprocated goodwill.” We love people for different kinds of reasons, so we have three different kinds of friendship, based on what is useful or pleasing or good. “Now those who love each other for their utility do not love each other for themselves but in virtue of some good which they get from each other.” The idea of a “friendship” being based on usefulness to one another might seem base, but think about a friend at work or a neighbor: you wish well to and feel affection for one another, but the cooperation and alliances form the basis of the relationship. These relationships may go no further than utility and tend not to last very long once the usefulness goes away, as we change workplaces or neighbors. What we love in such relationships is what is good for ourselves. We love the usefulness of the friend; we do not love the person for who he is. The same is true for friendships based on pleasure. We enjoy our witty friend because of the pleasure she gives us, not for the person she is. Once we no longer enjoy our friend’s wit, these friendships tend to fade. In a complete friendship, we “wish good things to [our] friends for the friends’ own sake…because of themselves.” In a complete friendship, our friend feels the same way toward us, and we are also “both unconditionally good and beneficial to each other.” Our friend has character traits that we love because they are good, and this friendship itself is intrinsically good. Was my early friendship with David at least partly based on usefulness and pleasure? Well, yes, as I look back on it and ask myself this question for the first time. David came from a wealthier neighborhood than I, and he had gone to the “in” junior high, whereas I had gone to the “out” junior high, with a relatively higher number of poorer and intellectually weaker students. By becoming his friend, I moved up in social status and became accepted by David’s friends. And certainly, his quick wit and good spirits gave me pleasure. I was aware of some good character traits (aka “virtues”) he possessed, such as his intellectual persistence, curiosity, and sociability. It is sharing and valuing virtues that for Aristotle form the basis of a complete friendship. But David had some bad character traits (aka “vices”) that made a complete friendship challenging, as at times he seemed to be a social climber, his attention and time quickly moving to someone else more important. That’s ironic: I just realized that I criticized David for what I used him to do for myself, to climb up socially. In 1977 David made another grand decision, reminiscent of his ’68 trip to Czechoslovakia: he decided to leave his job as a journalist to run for the U.S. Senate. He walked the entire distance of the state — 1,654 miles — from Manteo to Murphy, carrying a change of clothes and his fiddle. He got lots of good press coverage, promising voters that he would not “fiddle around” if they sent him to Washington. But that campaign was also when I first began to see the cracks. He ran up large phone bills, came in 5th of 8 candidates in the Democratic primary, and destroyed his relationship with his fiancée. In my eyes, he was never quite the same after that campaign. He lived here and there. He started spending more and more time playing with various bands. For a while he lived in a huge apartment in an old building in the French Quarter of New Orleans and played in a band on Bourbon Street. In the 1980’s David inherited a sizeable amount of money when his father died, offering the chance for financial stability. But again he had a grand vision that he put into action. 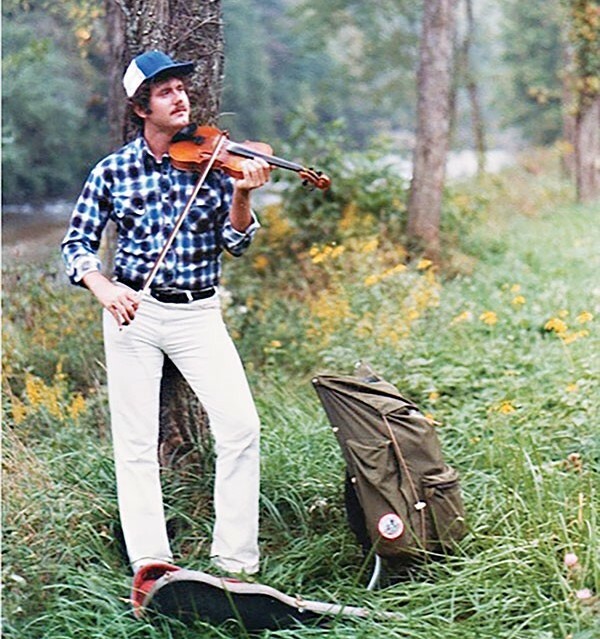 He traveled a good bit of the Eastern U.S., visiting symphony orchestras where during a performance he would donate to that orchestra an expensive violin that he had purchased from John Sipe’s Presidential Series. Sipes named those violins after various presidents. David bought a few and then donated them to musicians or the orchestras in the cities where those presidents were born. For example, he went to Missouri to deliver the Harry Truman violin. Often David performed, playing his violin with those orchestras. Once he showed up at our house in Charlotte, his usual energetic story-telling self. “I am travelling around visiting all the best minor league baseball parks,” he said. “Three nights ago I was in Toledo, and then the night after that in Nashville, and last night the Asheville Tourists.” And then he would go into rich detail on the glories of each park and its history and the history of the city. It sounded a grand life, except for a couple of things. He almost always was alone on these long road trips. And it seemed more and more often the story would take a strange turn, “So right as I was coming into Charlotte I saw my odometer hit 400 miles, and that make me think that in another year it will be 400 years since the founding of the Old North State, and so I have an idea that could connect the Republicans and Democrats in that…” and suddenly I could no longer follow what he was saying. At some point, maybe in the early 1990’s, David no longer came back to Charlotte and I lost touch with him. (Or did I just not try hard enough to keep up with him?) I eventually heard from friends he was living homeless in the Triangle, back and forth between Raleigh and Chapel Hill and Durham. He played his violin as beautifully as ever, but on the streets. He never asked for money, but gratefully accepted it if offered by folks who were listening. He rarely bathed and smelled bad, and of course his clothes were dirty. That’s what it’s like if you’re homeless and living on the street. Going to a shelter was not something David was willing to do. Aristotle, Nichomachean Ethics, Book 8, chapter 1, translated and notes by C.D.C. Reeve (Indianapolis: Hackett Publishing, 2014). Book 8, chapter 3, emphasis added. Thanks to David’s niece, Meg Whalen, for this information, via email. This is a fascinating story about a guy I also knew, though not very well. It was not a complete friendship, since I liked to tell people that I knew the guy who wore the Blue Devil outfit. I guess I was trying to raise my social standing by being “in the know. Can’t wait to read the rest of the story about David. Ike, thanks so much for your encouragement and comment. We all have our claim to fame, don’t we? Nice touch…great memories. David was one of my more unique friends. Thank you, John. I hope you are doing well. I guess I need to start following you, I can’t wait to hear the rest of this story! Sounds an awful lot like schizophrenia which is often a disease of very brilliant people. Very sad. Thank you for your comment, Miriam. Thoughtful and totally captivating, Norris. I truly look forward to reading “the rest of the story,” as Paul Harvey used to say. Thank you, Linda! I do indeed remember Paul Harvey, and he well maybe why that phrase was probably in my unconscious. Norris thanks for sharing this. I knew who David was in high school simply because of his fame as a student and his accolades. This is an incredible story. Thanks for “the telling.” Interestingly Randy and I were in Prague a couple of weeks ago where the uprising in the Spring of ’68 still stands out vividly to its residents. Cynthia, thanks so much for this. That is so interesting about your visit to Prague and that the memories of the spring ’68 uprising are still vivid there. Norris, when I think of early childhood friendships I think of you and Charlie. I lost a lot when we moved to the other side of town. Have always followed your intellectual career from afar and always admired. And this is a superb piece of writing about friendship. Cynthia reminded me of how similar this story is to my friendship with Richard Aldridge, an amazing rebel whom we lost far too soon. Randy, thanks so very much. I do remember our early childhood friendship so well and so fondly! I’d like to hear sometime about your friend Richard. Excellent story Norris. I hope David found enjoyment and peace of mind. I remember David very well. He was brilliant. Thank you for sharing. Thanks so very much. I appreciate your taking the time to write. Hi this is GREAT! i can not wait to see the rest. It is good to hear from you DR WOW! My wife Karen says hi she worked with you in Charlotte one year at Carmel Academy. Lew, thanks so much for your encouraging message! The “DR WOW” gave me a good laugh. Please tell Karen hi back to her; I remember her there, teaching drama I think. A mesmerizing account of the meanings of friendship and what it means to reflect on how we can understand ourselves through and with friends. Honest, poignant, and yes, I can’t wait until the rest of the story. Thanks Dr. Norris Frederick! Zachary, thanks so much for your insightful comment and encouragement! Your reflections on David McKnight take me into my own soul as I reflect on people I have been blessed to know and become friends with in my work as a pastor. Some seminary professors try to tell you that a pastor should never become friends with people in his/her congregation. Hogwash. Friendships are inevitable when you are with people week-after-week, year-after-year, when you come alongside them in times of crisis, pain, or, yes, celebration, and when they share with you some of the deepest parts of their lives. Every person has deep parts of their lives that only a few – if any – are allowed to see. Being invited into those places is a sacred privilege that must be handled with great care. Pastors are often invited into those dark places and the result is that we know things about people that we’d just as soon not know. And yet, that knowledge deepens the relationship even more because we, too, have within us some dark places, sad places, fearful places. Connecting with people at that deep level is a gift, I believe, and I also believe it is part of the abundant life that Jesus said he came that we might have. Life is most abundant when it is fully embraced – the highs and the lows, the joy and the sorrow, the pleasure and the pain. I give thanks for the sacred privilege of being with people in ways that are deep, and that add to the abundance – the real abundance – of life. Of course, it is also brings pain. When I am conducting the funeral of a church member, I am not just conducting the funeral of a church member. I am conducting the funeral of a friend, a very special friend. There is pain in that. It hurts, and yet life would be empty, shallow, without those experiences and those relationships. Thank you so much for sharing your thoughts and experiences of friendship in your work as a pastor. There is so much in your comments worthy of reflection, but for now I will highlight just one: ” I give thanks for the sacred privilege of being with people in ways that are deep, and that add to the abundance – the real abundance – of life. I met David in the mid 80’s when my new wife and I moved to Durham and started visiting 9th Street. We would stand there in amazement outside the front of the old pharmacy that sold REAL milkshakes listening to this virtuoso play his violin. We eventually had Adam who then joined us on those visits, hoisting up on the trash bin to listen to David play while one off us would go in a buy them. David somehow ‘knew’ a song that would delight him each time we came walking up the street. Years later I learned that he did that instinctively to just about every person, but with a different song or tune particular to that person , AMAZING!!! That was followed by three more daughters who also got to ‘know’ him. He was (and continues to be) a historical part of 9th Streets’ history and character. Fast forward decades later and far too many stories to relate personally with David that would take volumes when Cheryl and I were privileged to pick him up at the Nursing facility on Erwin Road to take him one last time to Elmos for his birthday. We all sang HB to him and the waitress told her personal story about David that you could see in his eyes touched him dearly. Which it’s doing to me right now as I write this. David was never about himself while we knew him. He was selfless, humble and genuinely in love with children and every one who stopped to listen to him play and tell stories. Thank you for stimulating these very special memories and placing a written record of how a person’s life does impact those they leave behind. David STILL is a blessing to our lives.